Kitchen appliances can make the difference between loving and hating your kitchen. At ShopCookware.ie, we make sure that you enjoy the first option thanks to the wide range of kitchen appliances we stock that will improve your cooking life. We stock a whole range of stand mixers, hand mixers, blenders, food processors, electric kettles, toasters, nespresso machines, coffee machines, slow cookers and much much more. Kitchen Aid: This elegant equipment is tough but beautiful. Top quality stand mixers, food processors, toasters, kettles and blenders will ensure that you have a fantastic start to the day, with such a wide array of colours available this will be the most difficult decision! Magimix: Originally known for their food processors, Magimix endeavour to make life simplier for all chefs. For this reason they work well and are built better to last longer. Magnificent cuisine systems will come into use everyday once you try Magimix products, while the magnificent Magimix Nespresso Coffee Makers promises delicious espressos in a moment. Kenwood: This trusted brand has offered quality and affordable products for many years now. Find products like the Kenwood Chef Classic which will soon become your most trusted assistant in the kitchen. Krups: These modern appliances will cater for all of your needs. Their coffee makers will never disappoint some of the most powerful on the market. Stellar: This electric cookware is the ultimate in cooking convenience and will consistently produce perfectly cooked meals to the highest standard. 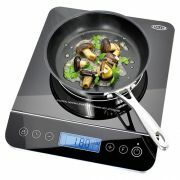 Check out the Stellar electric wok or the stellar portable induction hob making any suface a temporary cooker for use with induction friendly cookware. This product is especially usefull for supermarket trials when you need to covert a grocery aisle into a temporary kitchen in seconds. Delonghi: Italian experts in kitchen appliances with a range of fantastic kettles, toasters and the afforable automatic Lattissma coffee machine from Nespresso, which is revolutionary in supplying your with barista quality lattes and capuccinos in the comfort of your own home. Browse through our extensive lists of appliances now to find the perfect goods to suit your needs and style. ShopCookware.ie selects only the finest equipment on the market from top manufacturer's so that you can enjoy the benefits of cooking with top quality goods. Browse our site regularly to take advantage of the various specials on our products from kitchen appliances to tableware. A French company originally known for their Food Processors Magimix endeavour to make life simpler for all chefs. For this reason they work well and are built better to last longer. All of our electrical products come with a one year guarantee while many other brands offer extended warranties. Most importantly HOLD ON TO YOUR RECIPET, this is your guarantee. Also many brands and companies offer registration services for their products, so go for it, what can you lose?